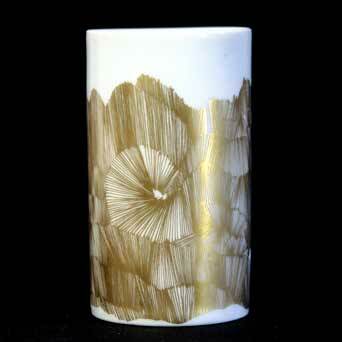 Studio Linie cylinder vase - 3½" (88 mm) high. The first Rosenthal company - a porcelain decorating business - was set up by Philipp Rosenthal (b1855-d1937) Erkersreuth near Selb, Bavaria in 1879. In 1890 the factory moved to Selb and a year later, porcelain being in short supply, a factory was established for the manufacture of white porcelain. The company expanded steadily in the next ten years, and in the first half of the twentieth century opened new factories and acquired other companies. They were active in the electrical and automotive industries in addition to their traditional field. Art pottery departments were established in 1910 and in 1920. Because Philipp Rosenthal was a Jew, he was forced by the Nazis in 1934 to leave the company, but the company continued to expand before, during and after World War II. Philip Rosenthal (son of Philipp) joined the company in 1950 and carried on in his father's footsteps. It has been said that the success of Rosenthal is based on the close attention paid by both father and son to marketing techniques, and the setting up of Studio Departments and Concession Shops in the post-war years paved the way for the Studio Line launched in 1961. Walter Gropius, the founder of the Bauhaus designed a new factory for the company in Amberg in the late 1960s. By the time of the centenary celebrations in 1979 Rosenthal employed around eight-and-a-half thousand people.